Rising star Sam Curran has put himself in the spotlight as one of England’s best hopes to make up for the absence of Ben Stokes in the Lord’s Test against India. Coach Trevor Bayliss echoed England captain Joe Root’s glowing praise for 20-year-old all-rounder Curran, although he acknowledged Stokes will be missed when England try to consolidate the 1-0 lead they earned so brilliantly in a thrilling series opener at Edgbaston. Both man of the match Curran, in only his second Test, and then Stokes – just two days before the court date in Bristol that will rule him out of Lord’s this week – played starring roles in the 31-run win on Saturday. After banking that success in England’s 1,000th Test, Bayliss called on those who will be at Lord’s to try to fill the shoes of premier all-rounder Stokes. England yesterday named Curran’s uncapped Surrey team-mate Ollie Pope, also just 20, in place of dropped batsman Dawid Malan in their squad of 13, with Chris Woakes unsurprisingly the choice to replace Stokes. They will understandably be hoping Curran can deliver again at Lord’s after his five-wicket match haul and maiden half-century. When they haven’t got the ball or bat in their hands, they’re a little bit (agitated). Bayliss has great confidence already in the youngster, revealing the only issue so far with Curran – as with his brother Tom – is keeping him happy whenever someone else is batting or bowling. “He wants to be in the fight – just like his brother,” said Bayliss. “They want the ball, they want to do the batting. As for the enforced absence of Stokes, Bayliss said: “Obviously it’s something we would have liked to have not been happening. “It will be interesting to see who can step up and take his place. “Someone, or two or three guys, will have to step up and do the extra yards ... take up the slack. Bayliss does not expect Stokes’s absence, or the headlines it may create, to distract any of his colleagues. 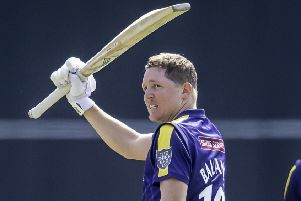 “I’ve got no concerns about it – Ben has no concerns about it (either),” added Bayliss. Asked too if India may prove reliant on their captain Virat Kohli throughout the series, the England coach agreed – but pointed out England too have a nucleus of proven batsmen, alongside others yet to establish themselves truly. “We’ve got a few guys who are not necessarily cemented in the team – and that puts extra pressure on people like Root, (Jonny) Bairstow and those guys to make the big scores. “I don’t think it’ll be any different for India. “The way (Kohli) played (in the first Test) was high-class stuff. “(But) if we can put pressure on the other batters in the team that’s going to add to the pressure on him. “When the ball’s moving we’ve shown that a few of their guys do struggle against it. Malan has paid for his poor form of late, and Bayliss admits the low-scoring nature of the titanic match in Birmingham has put batsmen under the microscope. “I’d be lying if I said it wasn’t a concern ... losing plenty of wickets in quick succession,” he added. “(But in) the four innings there were wickets falling left, right and centre.